The Auto Sign-in feature in Google Chrome automatically signs you into Chrome browser when you login to any other Google Account like Gmail or YouTube. You will find below the steps to Disable Google Chrome Auto Sign-in. Previously it was possible to remain signed into Google Chrome while also being signed-in to other Google services like Gmail, Drive and YouTube using another Google account. However, starting with version 69 of Chrome browser, users noticed that they were being automatically signed out of Chrome browser as soon as they logged into Gmail or YouTube using another Gmail Account. With version 71 of Chrome browser, users reported being automatically signed-in to Chrome browser, whenever they signed into Gmail, Google Drive or YouTube. The simplest way to get out of this whole confusing setup is to Turn Off Google Chrome Auto Sign-in feature and this will prevent Google Chrome from automatically signing you in. 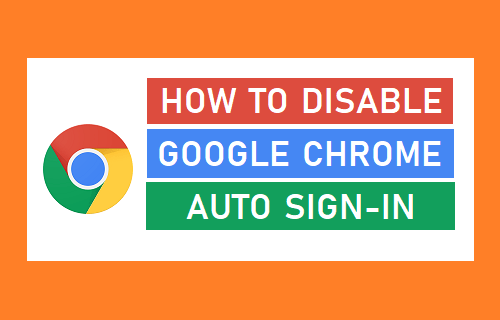 The option to disable the Auto Sign-in feature in Google Chrome is only available in version 70 of Chrome browser. Hence, make sure that you are using Chrome 70 or newer version of Chrome browser. You can check/update the version of Chrome on your computer by clicking on 3-dots Chrome Menu Icon > Help > About Google Chrome. After checking/updating Chrome, follow the steps below to disable the Auto Sign-in feature in Google Chrome browser. 1. Click on 3-dots Chrome Menu icon located at the top-right corner of your screen and then click on Settings in the drop-down menu. 2. On Chrome Settings screen, scroll down to bottom of the screen and tap on Advanced. 3. On the Advanced screen, disable Allow Chrome sign-in option located under “Privacy and Security” section. 4. Relaunch Chrome browser on to save this change in Chrome browser settings on your computer. When the Chrome browser restarts, you will find yourself logged out of Chrome browser. 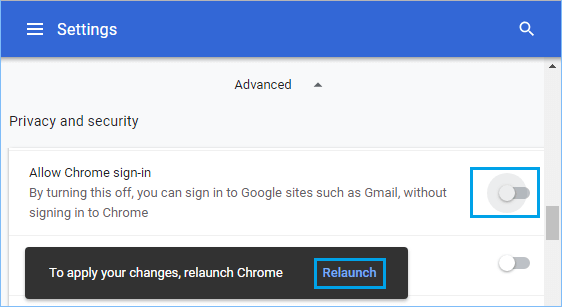 After disabling Google Chrome Auto Sign-in, you will be able to sign-in to Gmail, YouTube, Docs and other Google Accounts, without unnecessarily being signed-in to Chrome Browser.